Pharmaceutical ingredients Book from C.H.I.P.S. 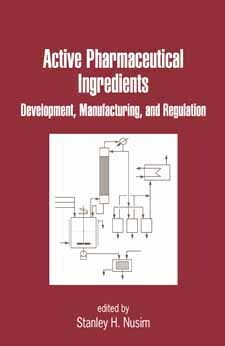 Active Pharmaceutical Ingredients, Second edition is a comprehensive guide to the development, manufacturing, and regulation of the preparation and use of Active Pharmaceutical Ingredients (APIs) globally. This new edition brings you up-to-date with the quality control regulations for APIs that have been added or amended since the first edition was published in 2005. These updates help ensure that pharmaceutical professionals and drug manufacturers meet the established and required guidelines set forth by the US and international regulatory industries.